Preserving a carved pumpkin is easy once you know how plus it lets you get the most bang for your buck. We all know how disappointing it is to spend the time to carve a pumpkin with our kids or grandkids and then watch its demise. It is especially frustrating if the design was really intricate or the pumpkin doesn’t even last until Halloween is over. 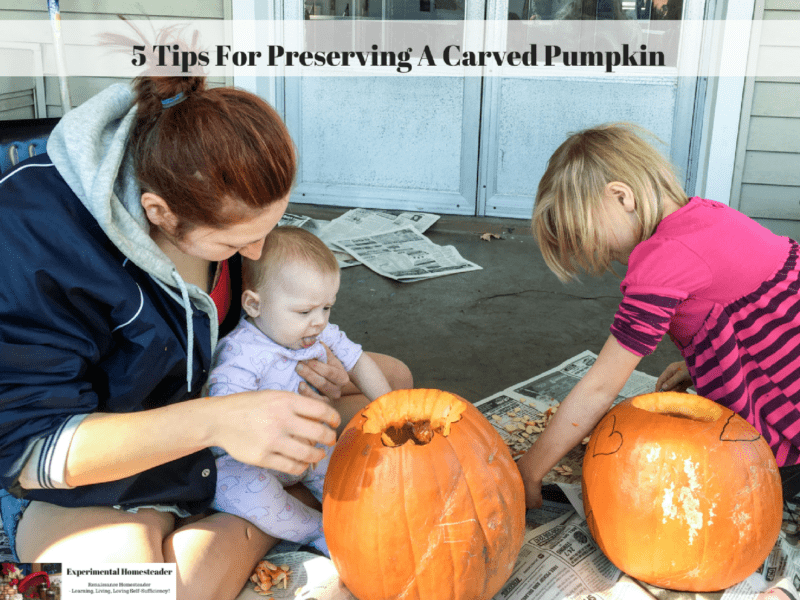 The good news is once you understand why pumpkins don’t last that long – and know how to properly preserve a carved pumpkin, you can keep them looking good longer than if you did not follow these tips. Pumpkins start showing up for sale around the end of September, but once you carve your pumpkin it doesn’t last long especially if you are using a candle inside of it. The weather during this transitional time of year also fluctuates quite a bit – at least here in Indiana – and that also contributes to the pumpkins quick demise. One day you might need to wear a sweatshirt and turn on the heat at night. The next day you might be hot in a tee-shirt and ready to turn the air conditioning back on. For those who really want to start their Halloween decorating early – and want to include carved pumpkins – here are five tips to help keep those pumpkins looking good just a little bit longer. This just might be the most important tip for extending the life of your carved pumpkin – and it begins when you choose your pumpkin. I urge you to go to a pumpkin farm to get one if you are not growing your own as the ones in the stores are often banged around and not handled with care. You want a pumpkin that is free of cuts, soft spots or excessive scarring. Be sure to carefully examine the pumpkin you choose – and do not think just because you are going to cut that bad section out it won’t matter. Once the the pumpkin has been damaged, the process of it decaying has already started. Choose a pumpkin that is heavy for its size and make sure the stem is intact. If you are not sure what a pumpkin should feel like, go someplace that has ones already picked and lift several of the same size. Shop around so you can compare the weight of various pumpkins of the same size. After carving the pumpkin keep it between 50 to 70 degrees Fahrenheit. Be sure to keep it sheltered from rain, direct sunlight and that is has good air circulation. Instead of using votive or larger candles, use low tea light candles. Another option is to use LED candles. Apply spray wax or petroleum jelly to the cut surfaces to inhibit desiccation and mold. While these tips won’t make your pumpkin last forever, they will certainly extend the life of your carved pumpkin. For those who shop extra early for their pumpkins because they want the best selection, I suggest that you wait a while to carve your pumpkin. Keeping the pumpkin intact and in a cool place, such as under a shade tree or in the corner of your garage, will certainly prevent it from aging as quickly as if it is left outdoors in full sun. Keep in mind the contents, including the seeds, inside the pumpkin are edible, so if you won’t use them yourself, I encourage you to share them with the birds or other wild critters. Just be sure to put them far away from your carved pumpkin and your front door. This way you don’t accidentally attract wild animals directly outside your front door. If you have comments or questions, I encourage you to leave them in the comments below!